She went on to the follow the internet boom to Credit Suisse, where she worked as a Web Application Developer and then as a Business Analyst for a total of nearly a decade. In that time, data science began to increasingly emerge as a professional field, and so did her interest in it. While she already had some of the necessary skill set under her belt, she began to realize from looking at job listings, going to conferences, and taking some programming courses on her own, that the knowledge needed was rapidly expanding to include things she didn’t yet know at all, like machine learning, Python, and advanced analytics. 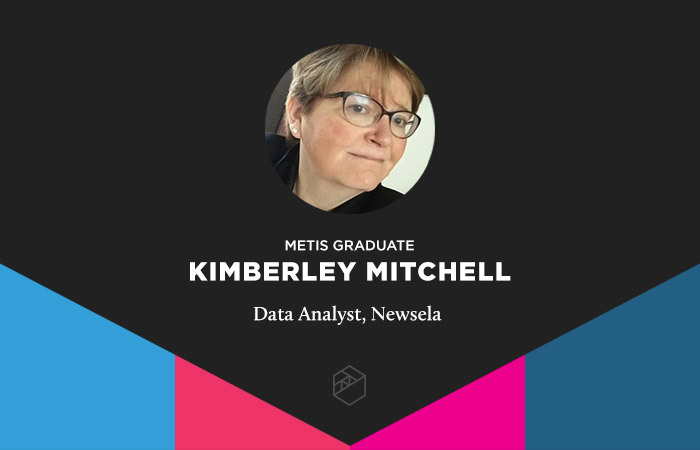 A little more than a year ago, in her 50s as she is now, Mitchell took our Data Visualization with D3.js part-time professional development course at our New York City location before looking seriously into our full-time data science bootcamp. She decided it was right for her based on a variety of factors, including the $3,000 scholarship provided to women. In the months after completing the 12-week bootcamp, she found her current job as a Data Analyst at Newsela, an instructional content platform focused on boosting K-12 education. It's fulfilling to work in a role that positively affects a student’s ability to learn, she said, especially because she holds the belief that learning can and should be a lifelong pursuit. Her day-to-day work includes using data and analysis to ensure teachers who’ve purchased the pro features offered by Newsela are satisfied and will (hopefully) renew their licenses. She’s been on the job since April 2017 and has run into some exciting but challenging data science-related problems so far. The first one she had to tackle? The huge Redshift database. She’s also routinely using data visualization and data exploration tools, as well as making plans for future projects involving predictive analytics. It’s Mitchell’s longtime love of statistics, numbers, and data, mixed with her lifelong passion for continuous learning, that combines for an exciting future built upon her already accomplished past.